of the school?s arts faculty following success in a competitive interview process. The study focused on working with and adapting where necessary, the existing facilities, analysing how to create flexible, contemporary and dramatic spaces without major new building extensions. The key areas identified for improvement centred on transforming the existing assembly hall into a small 280 seat adaptable flat floor theatre space and the creation of two new Dance and Drama Studios, all with a clear and bold identity of their own. 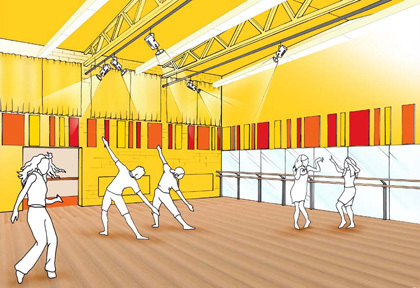 Phase 1, the new Dance & Drama Studios, have been economically created by dividing and converting the existing school gymnasium. Using dramatic bold colour and new acoustic panelling to add rhythm, movement and energy, two new spaces have been fitted out with sprung dance floors and full technical lighting and sound facilities that enable use both as teaching and performing spaces. Simple, careful design provides value and has produced two distinctive new spaces that reflect and react to their occupants and users.